Recently, the guys at Posterlounge got in touch to ask if I would like to review some of their posters. It came at a great time as we’ve been making a few changes around our house over the past few weeks. Most of the walls in our house are white, so I felt it was time we added some colour and wall prints are a great way of doing this. Posterlounge sell a wide range of posters from over 10,000 artists in a variety of materials and sizes. As well as posters, Posterlounge also have wall stickers, canvas prints, frames and more. 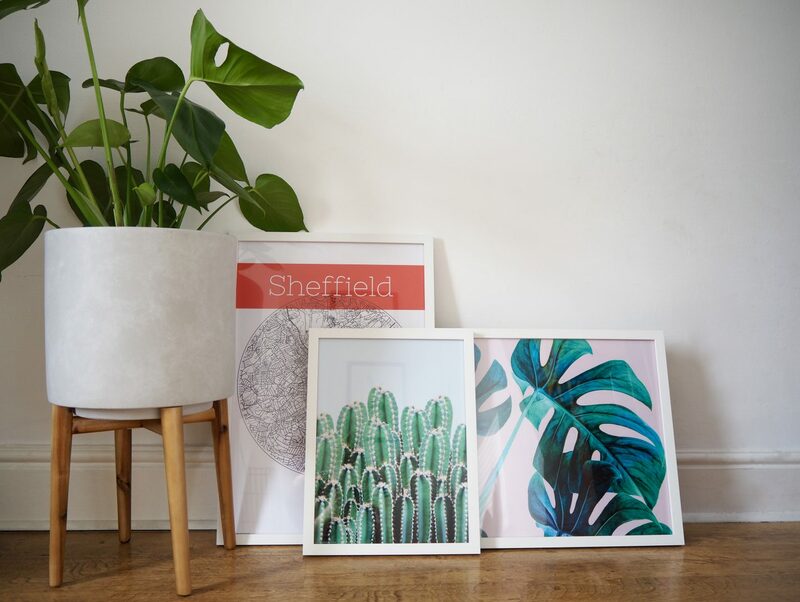 One of the things we’ve decided to do in our house is create a Sheffield themed gallery wall. It’s not completely finished yet, I still have a couple more frames to fill but so far I’m really pleased with it. I thought that this Sheffield map poster was a perfect addition! As well as fitting in perfectly with the Sheffield theme, I also love the pop of red which will add some much needed colour to the wall. Next I picked out this absolutely gorgeous wild leaves print. I am really into plants so I couldn’t resist this beauty. I love the pink background and plan to put this on our gallery wall along with the Sheffield map print mentioned above. This is a large 60cm x 40cm print which will work well in the space I plan to put it, but as with all of these posters there are lots of other size options available. The final print that I went for is this cactus one. Again, I love plants so there is a definite theme going on here! I went for this one in a smaller size as I plan to have this sat on our sideboard in the dining room. 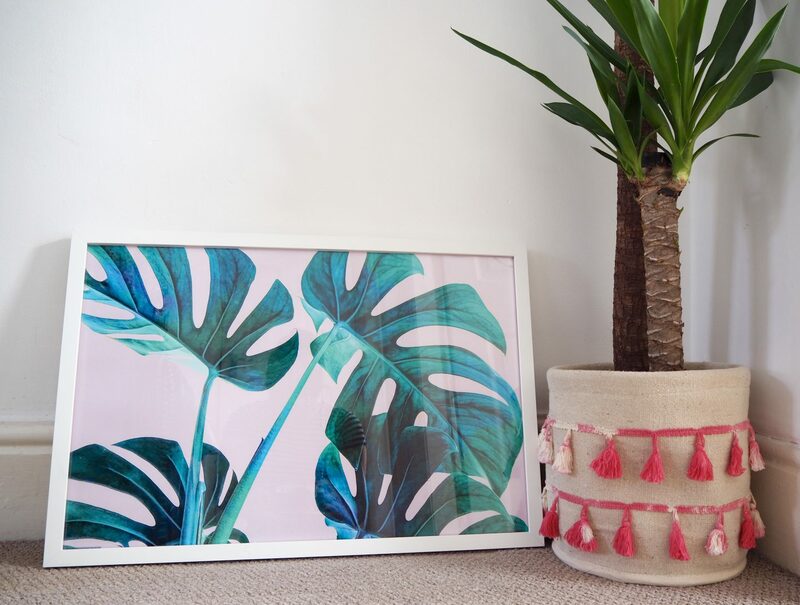 I love the colours in this print and it will definitely help to bring a bit of interest into the room. Posterlounge pride themselves on their high quality products and I have to say that I’ve been really impressed with the quality. I was surprised at just how heavy and sturdy the frames felt when they first arrived and I think that this high quality is what sets Posterlounge apart from other wall print suppliers out there. Their prices may seem a little high but remember that these are premium prints and frames that will not disappoint. I am very happy with my prints and would most definitely shop with Posterlounge again. To be in with a chance of winning a £50 voucher to spend at Posterlounge, simply enter via the Rafflecopter widget below. UK entrants only please. The competition will end at midnight on Sunday 28th October. The winner will then be contacted via email, please respond within 30 days or a new winner will be drawn. What do you think to the prints that I picked out? Love the prints! So bright and crisp! I’ve not heard of these before but I’ll be checking them. I’m looking for some new prints for my new sparkly spare room when we’ve finished decorating it! I love the prints of the foliage. These would look great in my conservatory next to all my plants. I love the prints and would like some for my living room. These are fab. Would certainly brighten up my home. Many thanks for the chance to win this lovely prize, they have some great posters to choose from. What a super prize – so many lovely pictures to choose from! They look lovely. I like Posterlounge. Posters are a much more appealing wall decoration than old fashioned prints and paintings. Also more affordable. I love the prints and would like some for our lounge! These are exactly whats needed to bring some colour and freshness to the home. They have some really unusual prints. Lovely prize which would enhance my home. would love some family pics to dot around the home, freshen it up and make it more homely! They have such a fantastic choice of posters, everyone would find something! Excellent way of adding character to the house. So many wonderful prints to choose from! This is something my daughter would really love for her new home. Be great for the empty spaces on my walls! I love your choice of prints 🙂 they’re lovely! What fantastic keepsakes l would love to win one thank you! They all look really bold and eye-catching. I especially like the tropical leaf print. Loving the big cheeseplant leaf print. It’s low maintenance greenery and I have the perfect place for this! The cactus print is spectacular! What a great competition! There are so many wonderful designs to choose from and it would be fun to pick out a nice one for my dining room. These are really nice would love one for a bedroom we’ve just decorated . What a fantastic giveaway, and such a fabulous selection of products. so many fab designs i would love!! love the idea of Sheffield wall! So great, I look be the white frames. Thanks for hosting. I love poster lounge, they have such a wide variety to suit every one! Love the Cacti Posters. Perfect for my best friend. This would be perfect I would love to choose a beautiful print for my bare wall. There are some lovely prints – I’d be spoilt for choice! Would be a lovely present for christmas for my mum.